I love data, particularly when it becomes useful. The Web Analytics Consultant is in charge of measuring performance on websites and applications. He identifies and measures KPIs (Key Performance Indicators) for companies, integrate and configure webanalytics and TMS (Tag Management Systems). The Webanalyst identifies traffic sources, volumes and quality of visits, and attributes conversions. He automates reportings for every stakeholders and provides CRO recommendations (Convertion Rates Optimization) as well as acquizition campaigns optimization. Companies now seek their ROIs (Return On Investment) and their LTV (Life Time Value) on their users. Every business has its particularity and a specific configuration of web analytics tools allows a better data exploitation. Do you actually measure the most important KPIs for your business? Do you have a precise idea of your acquizition costs? Are your acquizition campaigns profitable? Do you correctly identify your traffic sources? Have you ever heard of attribution modelling? Whether you are CEO, Emailing, SEA or SEO consultant, Webdesigner or Webmarketing manager, Webanalytics data exploitation benefits everyone and allows better decision making. Allowing data to be readable and accessible helps me sensibilize web and mobile teams seeking for a better performance of their organisation. When we start normalizing traffic sources, events and objectives naming schemes in the company, data becomes intuitive for everyone and looking at data starts to be a reflex. Tag Management technologies are new yet reliable and often show real opportunities for businesses seeking beter data exploitation. It allows the gathering of all trackings codes within a single tag that implemented only once in the site, allowing for rapid deployment without requiring technical intervention behind each tag. Google Tag Manager allows for example to create automatic events based on the user's behavior such as clicks on external links, custom tracking on loading times and getting a glimpse at how people scroll on your webpages. 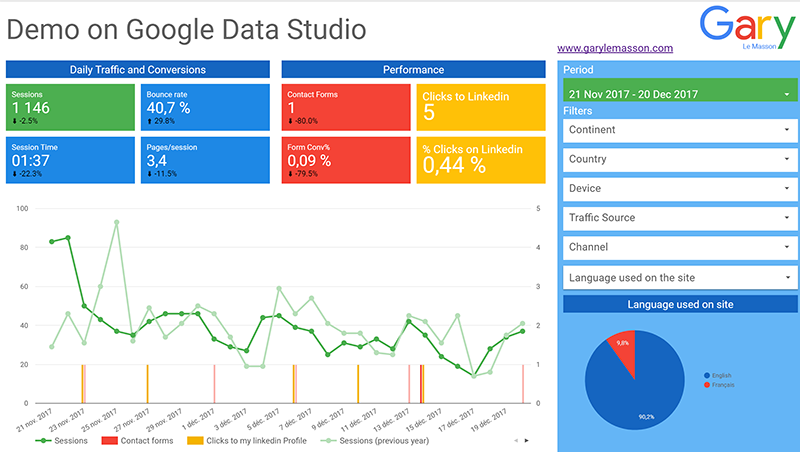 Best of all, the dataLayer allows to declare environment and user variables, such as a website category of content, a user profile, userID, gender or age... All these new dimensions are then easily integrated in Google Analytics and can be used in Google Analytics. Being able to measure things is great, but always remember to correlate figures with what's really happening on you site or application. As everyone around wants double revenues online, doubling acquizition budgets might not always be the most clever choice to make, as optimizing user journeys and convertion rates can also be a great solution that often will help you achieve more with less. You want to get the most out of your data? Contact me as I will be able to assess your needs and make you a proposal.